← Two Different Chocolate Nests for Easter – Both Allergen-Free! 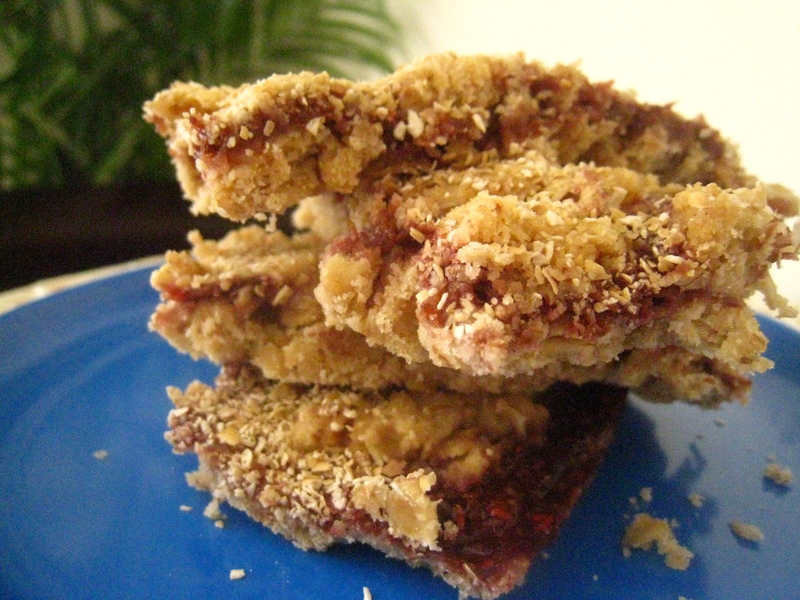 I was totally inspired by This Chick Cooks’ “NutriGrain Bars’ knock-offs! Her recipe looked so easy, and so delicious, I knew I had to try it. What’s more, as I read through the ingredients and method, I knew that it would be super easy to make allergen-free as well. And it was! The end result tastes a LOT like a “Nutrigrain” or other cereal/fruit bar, even with the allergen-free substitutes. In fact, you won’t even notice the absence of wheat or egg, I promise! I used homemade low sugar raspberry jam, but you can use pretty much any allergen-free jam or fruit spread. In a small bowl, mix together the ground flax seed and water. Set aside. In a large mixing bowl, whisk together oats, brown rice flour, baking powder and salt. In a liquid measuring cup, mix together apple juice, vanilla, coconut oil and flax gel. Pour into the dry ingredients and stir until you have a crumbly mixture. Press 2/3 of this mixture into the bottom of a 9×10 baking dish, and reserve remaining. Melt the jam for about 15 seconds in the microwave. Stir in 1 TBSP water, then spread evenly across oat mixture in pan. Add remaining tablespoon water to the reserved mixture and stir. Sprinkle on top of jam and spread as evenly as possible over the surface. Sprinkle oat bran over all. Bake at 325F for 25-30 minutes or until dough is cooked through. Allow to cool thoroughly and slice carefully into bars. Anne- your adaptation on the bars looks like it turned out to be delicious! I’m going to add a link to this post at the end of my post if that is ok because I know that there are a lot of people who are looking for allergy free recipes. Have a great day! This bar looks so good that I cant believe its made without ap flour.Wonderful recipe.Healthy and full of yum ingredients.Thanks for stopping by! Katie – they were delicious! I imagine it tastes much like the “real” ones. And yes, feel free to post a link; thanks! The flax is replacing an egg, so you will need to find something else that serves as a binder. Do you use EnerG egg replacer? That might work. Sometimes bananas will work as an egg replacer for me, although I haven’t tried it in this specific recipe. One egg substitute I’ve had some success with is: 1.5 TBSP water, 1.5 TBSP oil, 1 tsp baking powder, mixed together. Let me know how the bars turn out!